The Season XVI WPT Tournament of Champions is around the corner. On Thursday, May 24, 2018, World Poker Tour title holders will embark on fabulous Las Vegas to compete in the prestigious event at ARIA Resort & Casino. The final table will play out at Esports Arena Las Vegas at Luxor Hotel & Casino on Saturday, May 26. In lead up to the event, WPT.com is featuring all of the winners from Season XVI, who, along with the hefty first-place prize, earned a $15,000 seat into the season-ending WPT Tournament of Champions. For this feature, we’re focusing on David Larson, who topped a field of 440 entries at WPT Rolling Thunder to win $295,128. Ian Steinman made “The Fold.” Joe McKeehen was the headliner. But when the dust settled at WPT Rolling Thunder this season, David Larson was the one who emerged with the $295,128 first-place prize. The middle-aged account manager for an industrial company came from the back of the final table pack to claim an unlikely win. Larson found a double up with seven players left after being down to less than 10 big blinds. The 14-hour Day 3 wrapped up with Larson holding only 18 big blinds, but the deficit did nothing to alter his state of mind coming into the final table. The second hand of the final table featured Larson doubling up through McKeehen. In the span of 171 hands, Larson went from laddering up as others fell by the wayside to lifting the iconic WPT Champions Cup. Following the win, Larson was in a state of shock. He almost didn’t play WPT Rolling Thunder after bubbling the last of his four satellite attempts. Larson took the money he received for the bubble along with an ATM withdrawal and entered the largest buy-in of his life. Four days later, Larson earned his seat into the WPT Tournament of Champions. The come down from the win exhausted Larson. Upon revival, Larson soaked in well wishes from family and supporters. Larson remained active in the Northern California poker scene after the win. He also traveled to Florida for the WPT Seminole Hard Rock Poker Showdown. The trip doubled as a vacation for Larson, who says poker has reduced his available time-off from work to near zero. Larson walked through Seminole Hard Rock anonymous. The fame of becoming a WPT champion is yet to hit the casual poker fan, but Larson is reasonably content with his prize money serving as the primary reminder of the win. Larson is a life-long poker enthusiast who frequents all of the Northern California card rooms. The bankroll boom of winning a WPT title gives Larson more leeway to pursue his passion. He already has a schedule planned out for the World Series of Poker and will enter the $10,000 Main Event for the first time. Improvements in his overall lifestyle are what Larson credits for his success over the long days required to win WPT Rolling Thunder. Larson dropped 10 pounds a month before the event started and notes other positive lifestyle changes led him to be in top mental form. The win at Thunder Valley stamped the growth in Larson’s game. Larson was blunt in assessing how he’s improved his play. 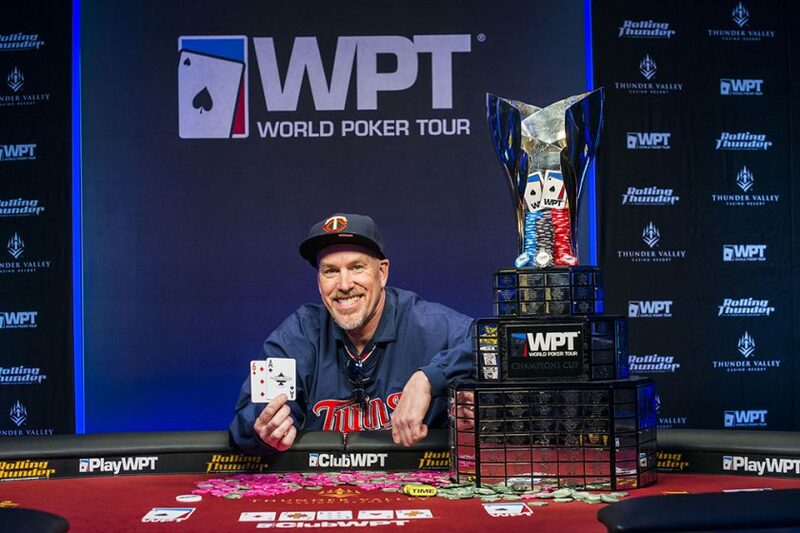 The next step in Larson’s journey is the WPT Tournament of Champions. Playing with some of the best players in the world excites Larson. One player Larson mentioned on numerous occasions that he hopes to meet is two-time WPT Champions Club member Antonio Esfandiari. A $15,000 buy-in is a new level of prestige for Larson and he is treating this 2018 edition of the WPT Tournament of Champions like the freeroll it is. To play as much poker as Larson can in this recent time span is a dream come true. Once the WSOP ends in July, “real life” begins again. His plans for Season XVII of the WPT are up in the air, but he will never miss another event at Thunder Valley. For the full list of features on Season XVI WPT champions, see below. The Season XVI WPT Tournament of Champions runs May 24-26, 2018 in Las Vegas. If you’re interested in becoming a WPT champion and competing in this event, you can play for your chance on ClubWPT.com. ClubWPT is where eligible VIP members can play for more than $100,000 in cash and prizes each month, including seats to WPT events. No purchase is necessary for the ClubWPT sweepstakes and the service is void in states where prohibited. See terms and conditions at ClubWPT.com.